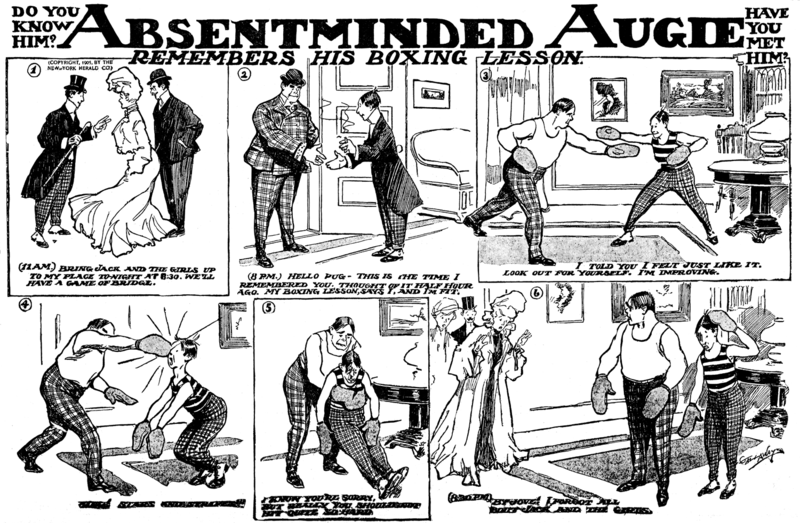 Walter H. Gallaway sure could draw well, but his grasp of basic writing, much less gag-writing, seemed a bit tenuous. When he contributed to the big humor magazines, Judge, Puck and Life, he was probably fed gags by the editors, but when he worked for the New York Herald 1903-1905 he seemed to be on his own, and boy does it show. 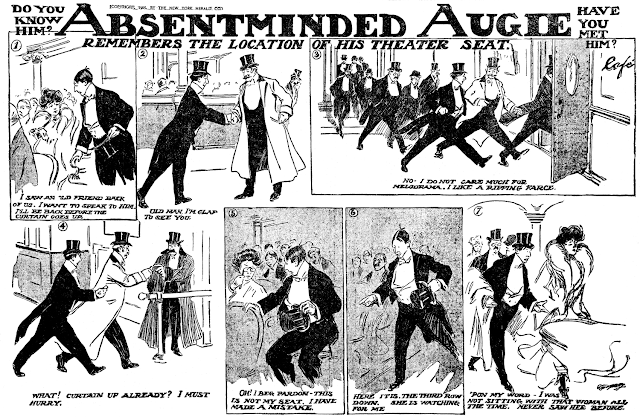 Gallaway's bread-and-butter feature at the Herald was Citizen Fixit, but today we'll take a look at Absentminded Augie, a short-lived feature that he offered from January 22 to May 21 1905*. As usual the drawing is a delight, and even the gag ideas are serviceable, but the captions? Oh my. The winner for plain awful is panel two of the second sample: "Hello pug -- this is the time I remembered you. Thought of it half-hour ago. My boxing lesson, says I, and I'm fit." I'm pretty sure I know what Gallaway is trying to get across there, but what he wrote sounds like something you'd hear in an English as a Second Language classroom. Panel 4: Bing! Stars and Stripes!!! Panel 5: I know you're sorry, but really you should'ndt (sic) hit quite so hard.